Asus ZenBook 13 UX331UN Ultra-Slim Laptop Comes with Windows 10 Pro 64-bit Operating System, Intel Core i7-8550U 8th Generation Processor ticking at 1.6 Ghz Upto 3.4 Ghz clock Rate, 16 GB DDR4 2133 Mhz Memory Upto 512GB/1TB SSD PCIE Gen3X4 Solid State Drive internal storage. Asus ZenBook 13 UX331UN Ultra-Slim Laptop also has DTS Sound,Integrated stereo speakers, Asus True Vision web cam, Microphone, Full-size Island Style With Numeric Keypad. 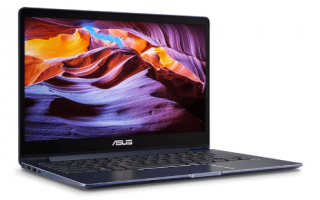 The Laptop has 13.3 inch screen size, 310 x 216 x 13.9 mm (WxDxH) Physical Dimension and 1.12 kg weight, Asus ZenBook 13 UX331UN Ultra-Slim Laptop has 50 Whrs Polymer Battery with 14 hours battery Life.